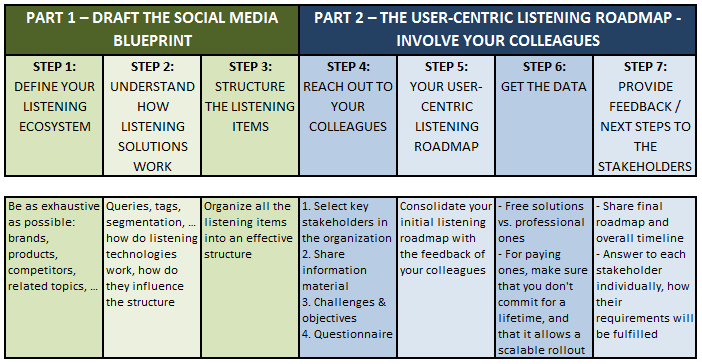 The first milestone when implementing social listening within your organization resides in defining your social listening blueprint (what you’ll be listening to) and your objectives in doing so (what you and your colleagues will make of it). Most of the time, people rush through this crucial step and end up with an ineffective listening structure, which is literally money down the drain, and this will put the company behind in terms of social strategy. There are ways to go through this step with a clear rationale mixing quick wins and long term strategy. 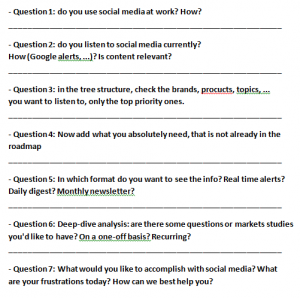 I published lately two posts on how to build a full-fledged social listening roadmap, a real whopper of about 30 pages! I’m afraid that there is no shortcut here and one has to take the time for this, but I’m also aware that I’m talking to extremely busy professionals and I compiled below the essential steps. It’s basically just you for this task, you’ll need a lot of copy and paste, and a sense of clarity. An Excel file will do. Write down your brand names, products, competitors, competitors’ products, key topics, … everything that can be of interest. It doesn’t mean you’ll monitor everything from the get go, but the next steps will show how to schedule each activity. It varies depending on the listening provider, but the core principle is around SEARCH QUERIES (collecting the data), and the SEGMENTATION (slicing the collected data via TAGS or multi-level segmentation, in a tree structure). This understanding will have a strong impact on how you structure an optimal listening blueprint. 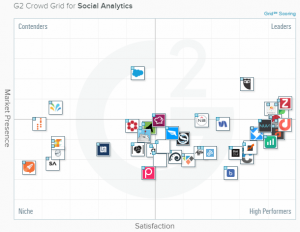 You can refer to this post (http://www.measuringsocial.com/index.php/2016/12/03/the-5-ps-product-part-1-create-an-effective-listening-roadmap/) for more information, also check documentation from your listening provider (and their main competitors). How are the main items organized, is there a hierarchy? Can you merge similar products in the same search query? Your website may be a good start to see how your company understands or structures its products/services ecosystem. Unfortunately there is no clear rationale here. Every single one of your colleague will view this hierarchy differently, with their activity at the top of the tree structure. Understanding how search queries and segmentation work (and limit you) will be a great help. You should end up now with a full map of what you can potentially listen to, and it’s probably a lot. You’ll need to prioritize. And what drives this is the outcomes, the actions the listening activity will generate. These actions will be performed by your colleagues, that’s where the more interesting yet sometimes messy human factor comes in. Some colleagues will be enthusiastic, others may be uncommitted or know better than you, but in all cases they won’t have much time for you and your communication and managing skills must be at their best. 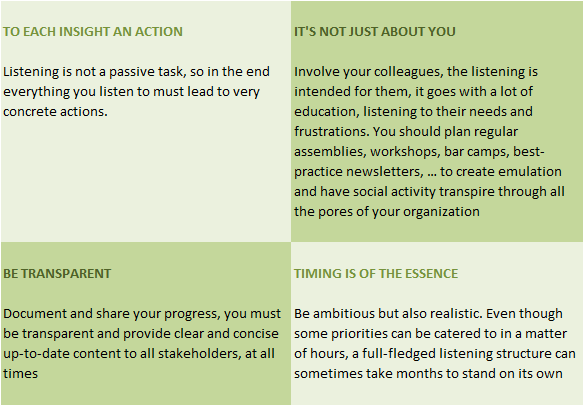 There are two objectives in the questionnaire: collecting the requirements in order to fulfill them (the obvious thing), and getting to understand your colleagues better, know about their social know-how, and their readiness and willingness to act on the insights. For the second part, you’ll have to give grades to each stakeholder based on their real needs and readiness to act, and prioritize not what you think is best, but what creates the best value. Now that you’ve got your plan, it’s time to contact your service provider. Usually people go through the above steps in a few hours, sometimes only a few minutes and come up with a mediocre brief or RFP. What results is a huge loss of time communicating with sales representatives of listening solutions and having them defining your objectives, based solely on what their technology can offer. So better keep full control of your strategy, even if it needs more time and headaches than what you signed up for. Professional solutions: you will have to commit most probably to at least 12 months, make sure that pricing is highly scalable since you’ll roll out to much bigger search queries or data volumes in a near future. Choosing the right match is no easy task. 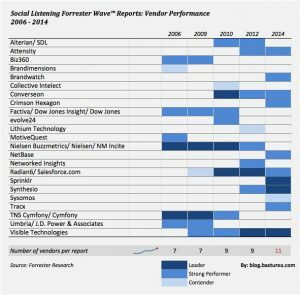 There are several comparison studies you can refer to, like the latest Forrester Wave reports or the G2 Crowd evaluations. There are many more comparison studies but one has to be wary, not all of them follow a real-life methodology. There’s a lot at stake when starting or revamping your listening strategy. Data costs money, reading the data costs even more (to your employer), and it all needs to be business-focused. Most listening solutions propose you to cut through the noise and go straight to the point. Well, this will be true only if you know what noise is, and mostly what the point is. And of course feel free to reach out in the comment section should you have any question.